“I’ve spent much of my adult life adventuring off to every corner of the earth I can reach. Each trip is its own adventure — a quest to quench a thirst, to see and to know what’s out there. “Of all the places in the world that have enchanted me on my travels, I was surprised to find one of my favorites right in my own backyard. Barely a three-hour drive from my home in Grand Rapids lie the peninsulas of Leelanau and Old Mission. “The region is deeply layered in every shade of green you can imagine. Its hills seem to roll on for forever, before spilling out into the waves of Lake Michigan. I’ve been captivated by this enchanting place, and I find myself returning again and again. “Each season brings its own something special to this wine country. Spring always takes her time arriving. And just when you think she might have forgotten this year, the earth starts to stir, driving up from the ground hints of green — ittle promises of all the new life to come. “Before you know it, the apple and cherry trees are in full bloom, painting the landscape in a beautiful pastel rainbow, as winter melts into a distant memory. By the time August has come and gone, the vines that course through the valley are so full and wild, dripping with fruit that’s almost ripe for the picking. “Autumn is perhaps the most magical time of year on the wine trail. 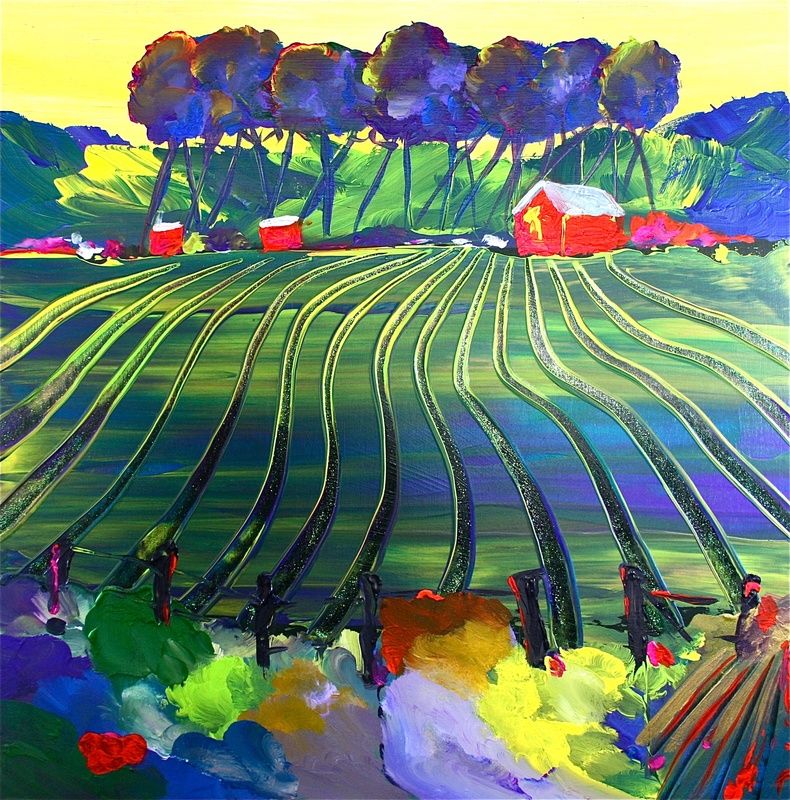 Its colors burn–bursting out in their fullest glory, creating a vivid, breathtaking backdrop for the harvest. Soon after the productive time ends, winter sweeps in, covering the land in its still, peaceful white slumber, giving the land and its people a chance to rest before the cycle repeats itself all over again. “This is the Michigan wine country I’ve fallen in love with. As an artist, I want to know it. I want to hear the stories of the people who live there and who farm the land and make its wine. I want to explore their artistic processes from the ground to the vine, from the grape to the glass. 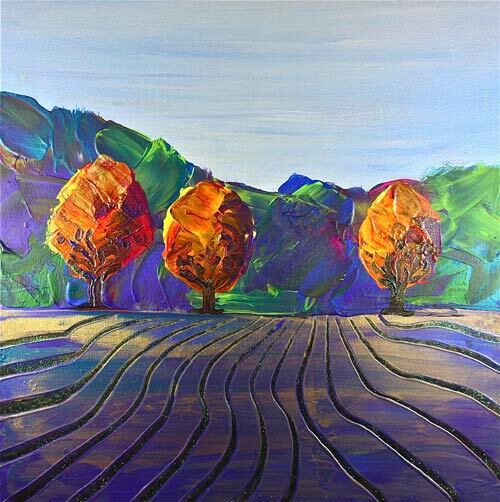 “‘On the Michigan Wine Trail’ is more than just a series of paintings attempting to recreate the beautiful sights of wine country. It captures the essence of the people there, and what happens to them as they inhabit and grow attached to this enchanting place. To purchase this painting or others by Stephanie, click here.